Some people say it’s dangerous to make assumptions. I disagree. In fact, assumptions are both necessary and empowering. Land managers make assumptions all the time. If we didn’t, we’d never get anything done. Assumptions are only dangerous when they are either unrecognized or untested. For example, it’s reasonable for me to assume that my car’s engine has an adequate amount of oil in it, but it would be irresponsible not to check the level now and then to be sure. Without the assumption that I still had oil, I’d probably stop to check my oil every mile or so and I’d never get anywhere. In order to move forward, I have to make reasonable assumptions, including that my engine hasn’t lost all of its oil since the last time I checked it. As land managers, we have to take a similar approach. Much of the time, we assume that species and ecological systems are reacting predictably and positively to our management, but we also do spot checks to reassure ourselves. Often those evaluations involve nothing more than a walk through a prairie to see how things are looking, but in some cases might conduct more intensive data collection. Sometimes rigorous data collection is used to test assumptions, but other times the process can be much more informal. Land managers also make broader assumptions about how restoration or management projects will contribute to conservation objectives. As we plan projects, we make educated guesses that help us design our work effectively. Then we implement the project and see what happens. If we didn’t make assumptions, we’d be paralyzed by indecision and never get anything done. It is critically important, however to recognize what assumptions we’re making, and to test them when we have the chance. Here are several examples of assumptions we make in our Platte River Prairies management, and some of the ways we’re testing them. Assumption #1. Prairie plants can survive periodic intensive grazing. Grazing is an important part of our management. Most commonly, we employ variations of patch-burn grazing, in which a portion of a prairie is grazed pretty intensively for most of one growing season and then allowed to recover for a couple years before it’s intensively grazed again. We use grazing to manipulate plant competition, especially by suppressing the vigor of dominant grasses to produce more plant diversity. It also is our primary tool for creating heterogeneous habitat structure, including important habitat conditions (such as short grass/tall forbs) that are difficult or impossible to create without grazing. Selective grazing by cattle can have positive impacts on both plant diversity and wildlife habitat. 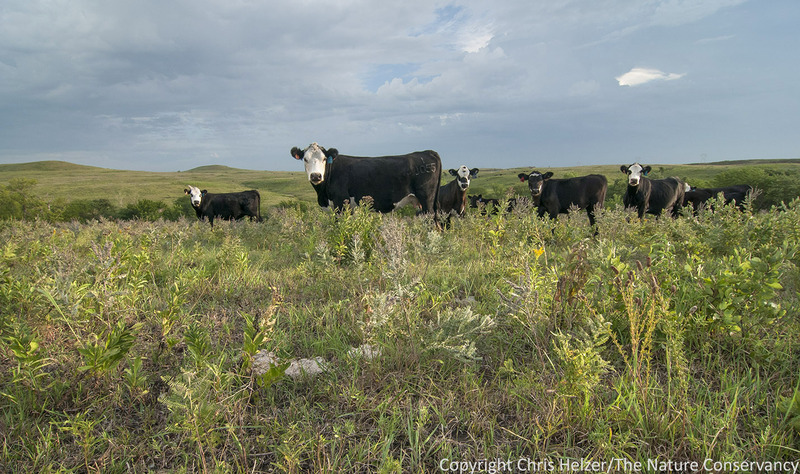 These cattle at Konza Prairie in Kansas are grazing on primarily grass and leaving plants such as leadplant and purple prairie clover ungrazed. Our data show that overall plant diversity is thriving under our management, and it’s easy to see the variety of habitat conditions we create each year. However, we’re making the assumption that we’re not losing any plant species due to periodic intensive grazing. It’s an informed assumption, based on experience and our understanding of history, including the kind of fire/grazing interactions that happened in these prairies over the last several thousand years. Regardless, it’s an assumption, and one we need to test. We collect annual data from some prairies and less frequent data from others that allow us to track individual plant species over time. So far, we’ve not seen any indication of plant species that are disappearing under our management. Even if we weren’t rigorously collecting data, we could still test our assumption by simply tracking the population size of species most likely to be impacted by grazing. We could use techniques such as photopoints or walking transects, or we could just mark and watch individuals or patches of plants over time. An example of the kind of data that helps us evaluate the impacts of repetitive grazing on plant species. Data from one of our restored prairies shows plant species that have maintained populations through 13 years of patch-burn grazing. The data represent the frequency of occurrence for each species within approximately 100 plots (1 square meter plots). From top to bottom, the common names of the species shown are Stiff Sunflower, Maximilian Sunflower, Illinois Bundleflower, Purple Prairie Clover, and White Prairie Clover. Assumption #2. Some exotic/invasive species are not harmful enough to warrant eradication efforts. We have more than enough invasive species to deal with on our sites, so we have to be selective about which to spend most of our time on. We set priorities based on experience, and focus most on those species we think have the greatest potential to harm plant diversity or habitat quality. However, we recognize that our assumptions about impacts could be wrong, so we test them – both through general observation and data collection. I’ve written before about data we’ve collected on both Kentucky bluegrass and sweetclover impacts, for example. Assumption #3. 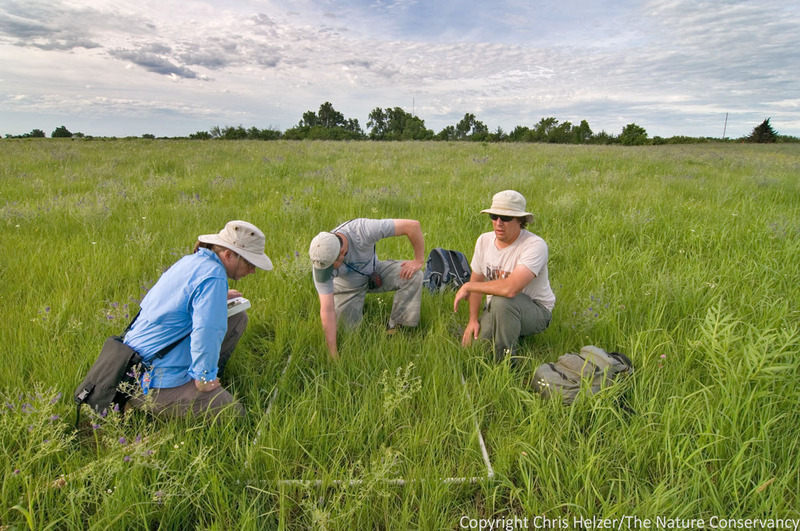 Restoring cropland adjacent to a small prairie will increase its conservation value. The prairie restoration work we do is not focused on re-creating historic landscapes, but on trying to decrease the impacts of habitat fragmentation. We assume that adding diverse prairie plantings around and between isolated prairie fragments will increase population size and connectivity for plants, insects, mammals, birds, reptiles, and more. Bigger and more interconnected populations should be more viable than smaller and isolated populations. Our assumption seems reasonable, but it’s expensive to harvest and plant more than 200 plant species in a crop field, so we need to see if we’re actually achieving our objective. More importantly, we need to be able to show policy makers that this kind of strategy produces substantial ecological impacts. Unfortunately, this kind of assumption is logistically difficult to test. We have a long way to go, but we’re starting to look at whether various species living in our unplowed prairies are also found in adjacent restored prairies. If those species aren’t using the new habitat, our strategy isn’t helping them. If they are, that’s good to know – though there are still more assumptions to test (e.g., do those new habitats facilitate successful breeding and/or migration and colonization?). So far, some preliminary investigations indicate that most ant and bee species appear to use restored habitats, and we’re now looking at small mammals and grasshoppers as well. 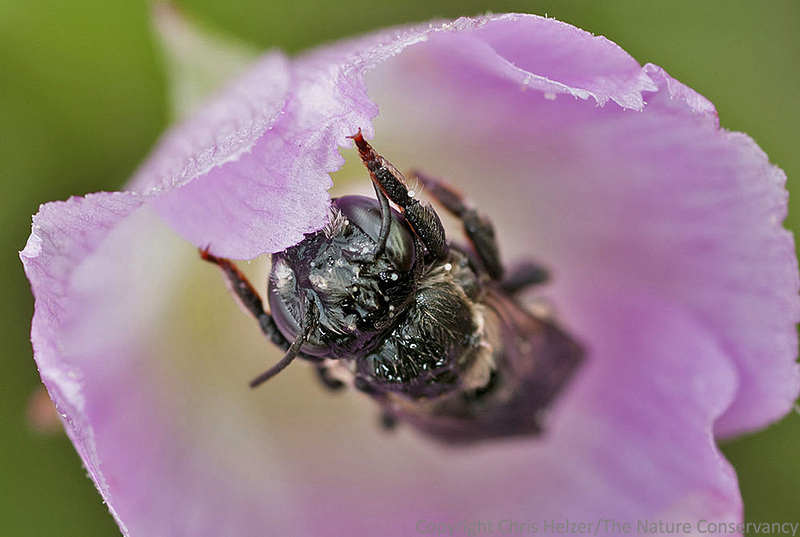 Bees seem to readily use the restored prairie habitats we create around and between formerly-isolated prairies. However, we are still evaluating bees and many other species to see how effective our restoration work has been. Assumption #4. We can maintain healthy populations of all prairie species through our “shifting mosaic” approach to wildlife habitat management. This is a big one, and is very difficult to test. We assume that by creating a variety of habitat conditions each year – including tall/dense, short/sparse, and mixed-height vegetation – all of the species in our prairies (insects, mammals, birds, plants, etc.) can find what they need each year. On top of that, we’re assuming that as we shift the location of habitat conditions between years, species can either move to appropriate habitat or hunker down until better conditions cycle back through. As with our assumption about plants and grazing, historical context applies. Prairie species evolved in grasslands that were subjected to fire, grazing, and drought, and preferred habitat conditions for any particular species would have shifted around the landscape from year to year. However, much is different today, including the size and fragmentation of grasslands, the presence of invasive species, and much more. Are today’s species able to survive significant variations in habitat conditions from year to year? Can a species that needs thatchy cover successfully find more of that habitat after a fire burns through its current location? If so, how far can it travel, and through what kinds of habitats? 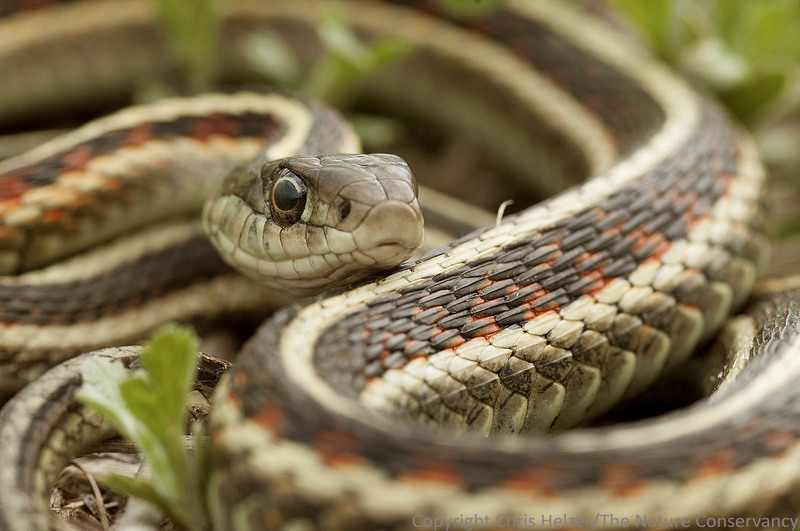 How easily can a species such as the red-sided garter snake find new habitat after a fire or other management treatment makes its current habitat unsuitable? We haven’t gotten as far in testing this assumption as we have with some others, but we think a lot about it. We’ve been gleaning information on animal movement from the scientific literature, and will meet with university scientists next month to discuss potential collaborative research on this topic. Most importantly, we recognize that we are making some big assumptions about our management strategies, and we keep those assumptions in mind as we make our annual plans. For example, we try to think about factors such as travel distance between similar habitat types (tall/dense or short/sparse habitats, for example) and we try to leave unburned refuges within large burn units. Hopefully, we’ll get more guidance soon, but in the meantime, we’re moving forward the best we can. Just as I watch for signs that my car’s engine might be getting low on oil as I drive, I also watch for signs that our land management strategies are working as we want them to. (More on that in an upcoming post.) Recognizing the assumptions we’re making is a critical piece of successful management, but testing those assumptions is just as important. Assumption testing doesn’t have to involve intensive data collection; it can be as simple as making some annual notes about whether or not a particular patch of wildflowers is still there, or keeping track of how invasive species respond to various management treatments. If we know what we’re uncertain of, we’ll be more thoughtful about management decisions and more observant of their impacts. What assumptions are you making? Are you working to test them? …oh, and don’t forget to check your oil now and then. This entry was posted in Prairie Animals, Prairie Insects, Prairie Management and tagged assume, assumptions, evaluation, grassland, land management, land steward, land stewardship, management, prairie, stewardship, wildlife by Chris Helzer. Bookmark the permalink. I believe the assumption that a shifting mosaic of habitat can provide useable habitat for most species, but my concern is that use is not the best indicator for some species. Pheasants and bobolinks use alfalfa, but due to haying alfalfa is an ecological trap. My concern specifically with patch burn grazing as a management tool is whether we are creating ecological traps for nesting songbirds by increasing cowbird use. Patch burn use keeps that cattle and the short vegetation in roughly the same position in the landscape (relative to a bison heard that would be on the move and had a vast area to move around in). Perhaps those bison grazed areas were population sinks for short periods of time, offset by better production once the bison were long gone. Much of the literature I’ve read on bird use in patch burn systems centers on whether birds are present or not, not whether they are successfully reproducing or not. Has anyone out there seen data or have experience with this issue? Jeff – I agree with you about use versus success. I think we have a lot yet to learn about that. I don’t know that I agree with you about bison being always on the move. I think bison would have camped out on burned areas for as much of the season as they could, except when moved around by predators (including people), but even then, would probably have returned for the forage quality. But – as you also pointed out, the cowbird and other impacts might have been higher in some areas but mitigated by the larger landscape. With patch-burn grazing and cowbirds, specifically, part of the answer to your question depends upon whether you’re comparing patch-burn grazing to no grazing (in which case, PBG may very well have higher cowbird parasitism rates) or to other grazing systems (in which case I’m guessing there would be little or no difference). Regardless, these are important questions and need to be included with all the other factors we consider when thinking about management. Thanks for excellent comments. The problem with data is it does not tell the whole story and takes lots of time to collect. For example, with the grazing assumption you could collect data for years and years and might realize your assumptions were correct, or incorrect, in hind sight. Alternatively, you could simply watch what the cattle are eating and try to make management changes in present time. I think the assumption that always catches me is when I think someone else’s experiences will also work in my situation. An example is Yellow Sweet Clover; you do not need to spend control efforts on this plant while we would have nothing but Yellow and White Sweet Clovers without control efforts in the Chicago area. Thanks for the educational post–you put your finger on the crux of management. To do it scientifically, you go with your best hypothesis, and fine tune your best practices as the data comes in. Great information.